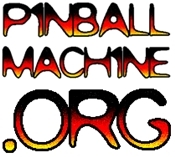 This video utilizing early ’90s video editing and effects reminds us the future is pinball. ha ha okay big points for taking my little barbs. Anyway, I and others will be looking out for whatever you guys have planned! Good luck with your project! !